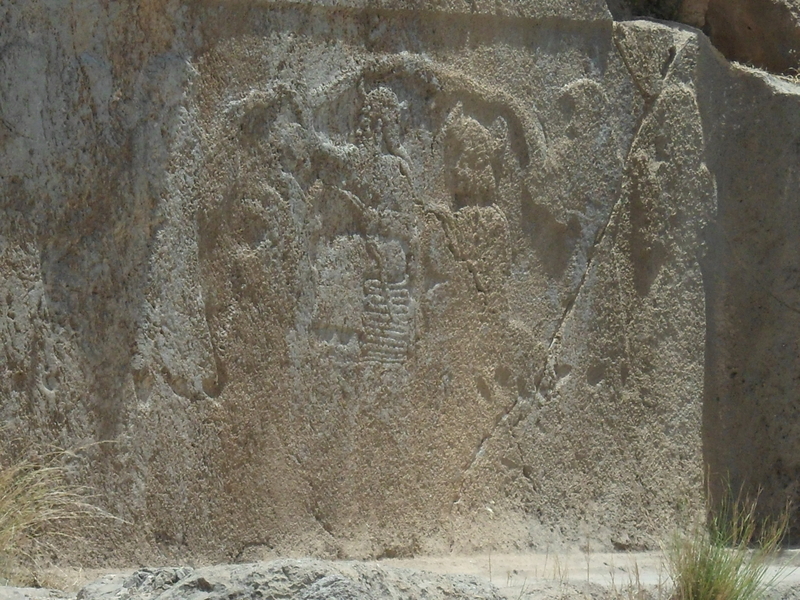 The relief at Kurangun consists of a relief with a ledge in front of it approached from above by a staircase decorated with reliefs of men in tunics approaching. Presumably, it was the site of regular ceremonies or offerings, as are described in the clay tablets from Persepolis in a later period. Art historians suggest that it celebrates the king as the bringer of water and agent of the gods. 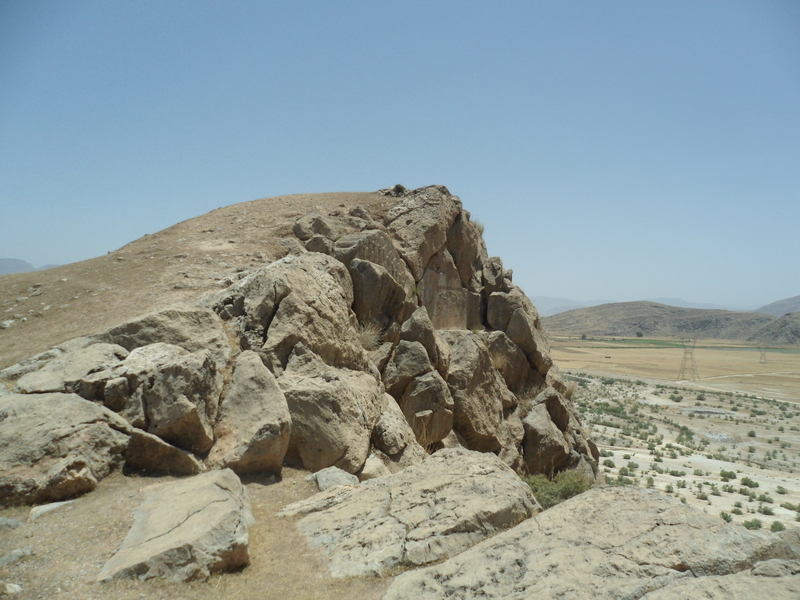 The cliff with the relief at Kurangun. Photo by Sean Manning, May 2016. On the side of the ridge opposite the relief, the slope up from the valley is steep but walkable. Photo by Sean Manning, May 2016. The central relief features a king in a horned helmet on a serpent throne. 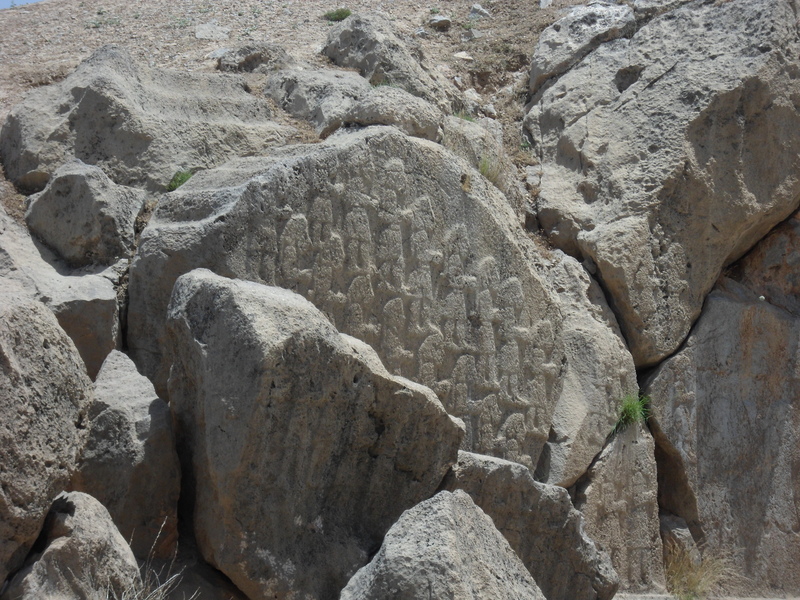 This carving helps scholars interpret the coiled pattern on the Elamite relief at Naqš-e Rostam. Detail of the center panel of the rock relief at Kurangun, showing a king seated on a serpent throne with a fountain of water and attendants. Photo by Sean Manning, May 2016. As the staircase and wide ledge show, the relief was meant to be visited. Today it can be reached along the broken stairs or by climbing slightly below them then back up. Anyone who is less adventurous or having trouble under the beating sun can stand on a ‘saddle’ of the ridge and examine it from a few dozen meters away. The staircase approaching the ledge in front of the rock relief at Kurangun. Photo by Sean Manning, May 2016. 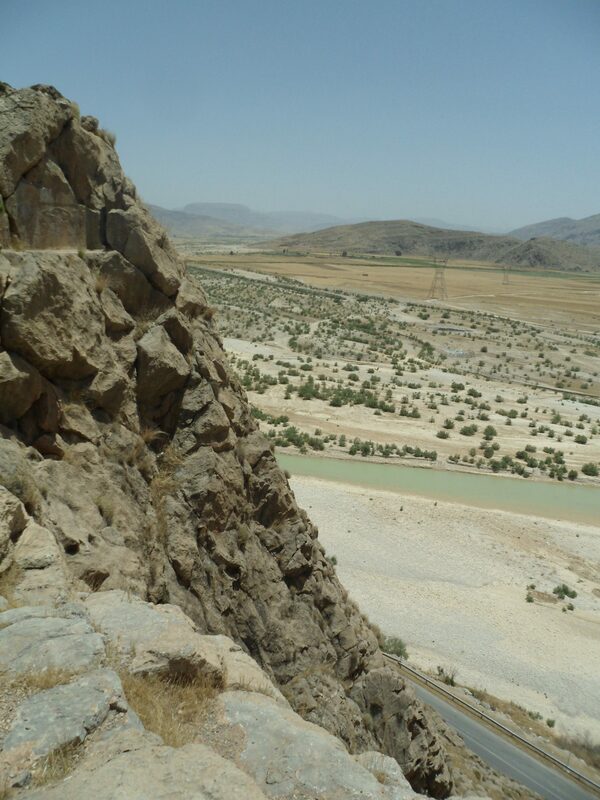 A member of the party climbs onto the ledge at Kurangun. There is room for half a dozen people who don’t mind crowds or heights. Photo by Sean Manning, May 2016. 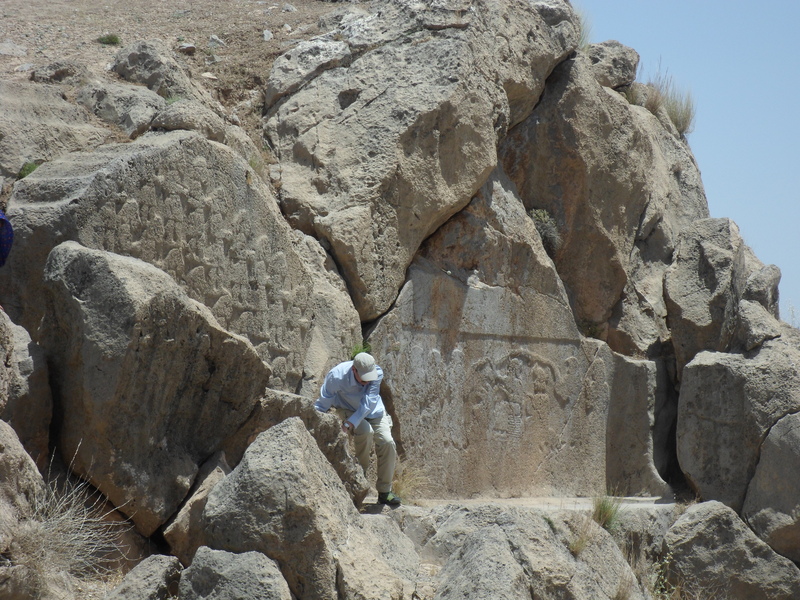 Throughout the long period in which kings carved rock reliefs in Iran, from around 2000 BCE to the Islamic conquest, they took care to place them where visitors could approach them and examine them. 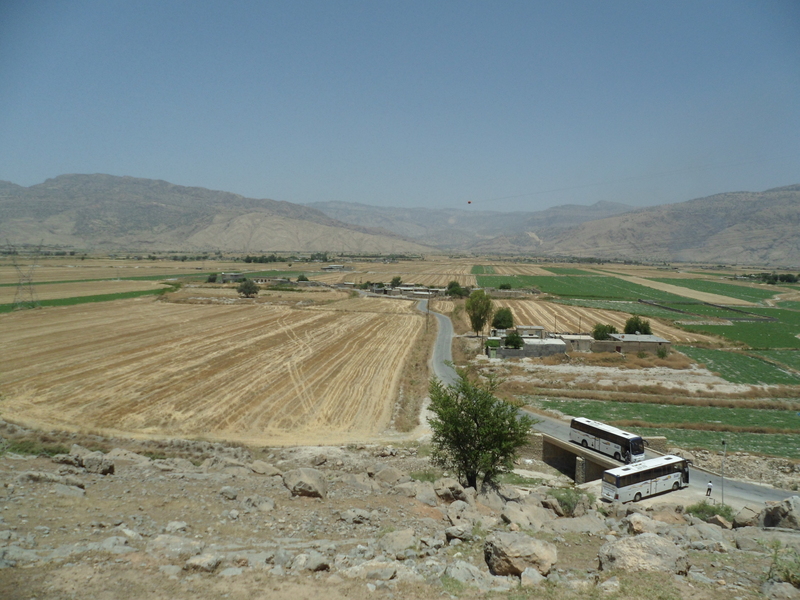 Most reliefs are even more accessible than Kurangun, being close to ground level along an important transport route. Behistun seems to be the only one which is placed where nobody can approach it. As I said above, I don’t think that Darius was just writing for the gods. But I do think that he was very concerned with both linking himself with the kings of old, and ensuring that his story would be preserved for posterity whether or not the kings after him believed it. Nobody could visit Darius’ relief to pay their respects, but they could not change it either. Further Reading: Livius.org s.v. Kurangun. For a letter from Cambyses to the college of priests of the Eanna at Uruk ordering them to show all the old stelai and monuments which they had or knew of to one of his agents, see Kristin Kleber, Tempel und Palast (Ugarit-Verlag, Münster, 2008) No. 33; there is a fragment of an ancient transcription of the ‘Cyrus Cylinder’ in John Curtis ed., The Cyrus Cylinder and Ancient Persia, p. 45. Edit 2016/07/08: Fixed one typo and added a clause to the first paragraph. You leave such an inscription in an inaccessible place to protect it from future damage, I conjecture. You foresee that centuries thence an intrepid Briton, or German or whatever, will drop down on a rope and transcribe it all. Such a defence works against spray-painters, I dare say. Presumably it wouldn’t work against any modern vandal as serious minded as, for example, those ISIS chaps. I have photos from some of the other ones which I hope to post in a month or two.